A page layout consists of the following elements in Drupal. The following information is targeting the users who want to design the layout of web pages on their own. Theme: Themes allow you to change the look and feel of your Drupal site.This is the smiplest and quickest way of starting building web pages. Current, the theme "Acquia Marina" is used in nca.us.tzuchi.org. Panel: Users can create new panels to define the layouts if predefined regions in theme are not used. Panels in Organic Groups some refering as Pages. When pages are created within Organice Group, each page needs to have its own URL and it will be displayed in the menu tabs on the top of each Group page. Region: Regions are pre-designated places for placing blocks of content. 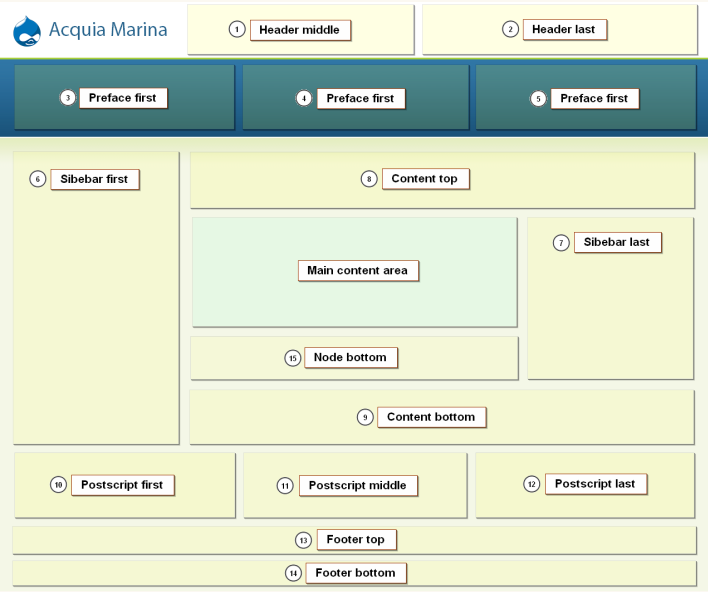 There are 15 regions available in Acquia Marina for placing blocks of content. Blocaks can be assigned to different regions through the adminisistror configuration, "Administrater" -> "Site Building" -> "Blocks" -> "Acquia Marina". Block: Blocks are boxes visible in the sidebar(s) of your Drupal website. Most of the blocks that you will see (e.g., recent forum topics) are generated on-the-fly by various Drupal modules, but you can also create your own blocks. A region can have multiple blocks stacking together. Views: The Views module provides a flexible method for Drupal site designers to control how lists and tables of content (nodes in Views 1, almost anything in Views 2) are presented. Traditionally, Drupal has hard-coded most of this, particularly in how taxonomy and tracker lists are formatted. Node: Nodes are the most basic elements in Drupal. Nodes can be defined as different content types. The following is an iillustration of the predefined regions in Acquia Marina theme. There are 15 regions. Panel has the following layouts users can choose from when a new panel (aka page) is created.